Pack size: 2 x 355ml bottles & 3 contact lens cases. Review Opti-Free Express Duo Pack I have been using this solution for many years now, its none rub which is exactly what I want. I don't want a fuss, just simple and easy to use. My contacts always feel fresh and new each morning. Perfect and super value. Review Opti-Free Express Duo Pack I've been using this brand and product for many years. It keeps my lenses clean throughout the month and provides slightly more product than Opti-Free Replenish for the money and works just as well. Although the price of this product is significantly higher in Ireland than in the United States where I began using it, Vision Direct is the most reasonable place I've found this product which is horribly expensive if bought in the pharmacy. 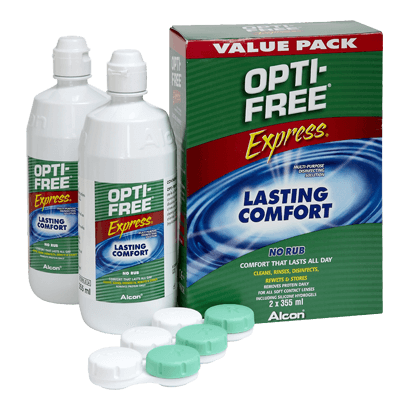 One of the world's most popular lens cleaning products, the Opti-Free Express Duo Pack will be suitable for lens wearers who do not wish to scrub their lenses clean, preferring to soak them after use. Keeping lenses clean and effective can be very time consuming, which is why products like the Opti-Free Express Duo Pack are so useful. In a world where we are busier than ever, this is a superb time-saver that really works. • Opti-Free Express is designed to quickly and easily cleanse all soft lenses, avoiding lens damage and ensuring perfect vision. It is particularly adapted for use with fragile Silicone Hydrogel lenses. • Cleaning with Opti-Free Express Duo Pack is simple. Lens wearers just have to place their lenses in the case provided, apply lens cleaning solution and leave their lenses to clean. • The Opti-Free cleaning solution ensures that proteins, germs and lipids are removed from the surface of the lens, and that when the lenses are worn the next day, moisture is retained for a superbly comfortable fit. • Comes in 2 x 355ml bottles, which should last for 3 months. Millions of lens wearers across the world have opted to rely on the Opti-Free Express Duo Pack to meet their lens cleaning needs. Anyone who wears soft lenses will find that this solution ensures comfortable, sharp vision.